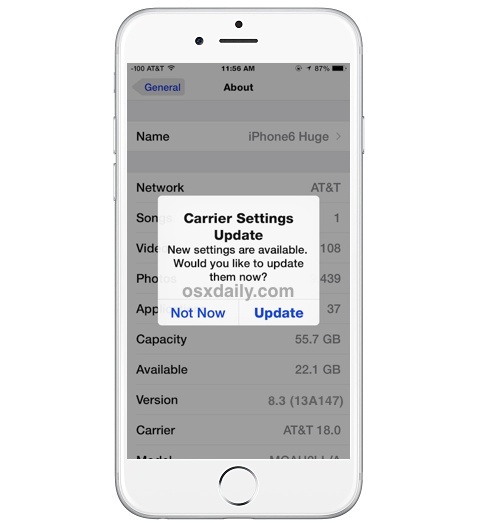 From time to time, your cellular network provider or Apple may issue a carrier settings update to an iPhone or cellular iPad device. The carrier updates are usually very small and make adjustments or improvements to carrier specific settings pertaining to the cell network, data, personal hotspot, voicemail, text messaging, or making calls. 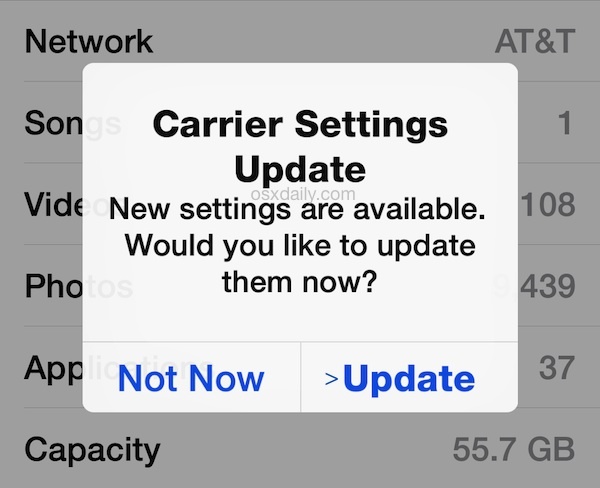 While you may see a carrier update pop up randomly on your iPhone, or a request to install one during a general iOS update, you can also manually check for these carrier updates on your own at any time. Installing the carrier update will make your cellular service cycle off for a moment and then back on, so you won’t want to try to install the update while you’re transferring data or in an important conversation, whether though a call, SMS, iMessage, or voice texting. Typically you do not need to reboot or restart an iPhone for any change to take effect or for the update to complete installation. Though these are usually pushed and installed onto your iPhone when you update iOS, if you haven’t seen a carrier update in quite some time, it can be a good idea to check every once in a while to see if one is available. Sometimes these carrier updates can even add new features to your iPhone, for example, a recent carrier settings update available to many iPhones on US cell providers offered the ability to change the data connection from LTE, 3G, or Edge, a feature that was made possible with an iOS update, but had to be specifically allowed by the carrier as well. It’s important to note that these carrier updates are specific to each cellular and mobile plan provider, and those are completely different from the general iOS system software updates, which arrive from Apple. Sometimes when you install a new iOS software update, a carrier update is made available as well, and sometimes a carrier update comes on its own without a broader iOS system software update. I have seen these on Verizon and AT&T when updating to a new version of iOS, and have never noticed any new features added. I think they mostly adjust cell tower and bandwidth behavior, because my iPhone cycles less after a recent one, which is nice since jumping towers seems to drop active connections often. I get these from time to time from my carrier in Australia Telstra. I never have dropouts when moving about or any other time for that matter. I guess that is what being with the worlds best mobile carrier (Telstra) is all about. Shame my US friends can’t experience this wonderful natioanl carrier. I had the opposite experience with Telstra. We were often unable to make or receive calls from our inside or outside our house in the eastern suburbs of Melbourne. Calls frequently dropped out. Telstra were never able to provide any constructive advice. We’re now with Virgin (on Optus network) which works fine. “if a update is available”. See anything wrong here? This message every time pops up on iTunes when it connects to iPad (wifi and cable). If I answer Yes, it says it is updated, but if I unplug and plug it will pop up again. If I follow your procedure, nothing happens – I guess it means no updates required. So to summarize, I cannot find a way to get rid of this check. Do you have some tips to tell me? Thank you. Guys, every time i connect my iPhone 6 plus to the iTunes on MBP — it asks me for: ” An update to the carrier settings for your iPhone is available. Would you like to install it now?” Every time I click to update – it shows update successfully , but when connect it ago – it skas again the same… Any suggestions how to fix this annoying “update” ? Result is correct, include purchase date, manufacturer date and perfect with me. So its really nothing we will notice right? I had the same repeating issue: asking to install new update every time I hooked my iPhone to the my Mac. I hope this could be a tip which will work for you as well. NEVER do it !!! I did it once and suffered a lot.. Suddenly after update, I started been charged 10 to 100 times more for normal data(internet) usage. Couldn’t even find any option to revert back the settings … Finally end up with changing the service provider from Airtel to Idea. Hi i have purchased a new iphone lately but i have ignored “carrier update” several times. Now my iphone is unable to detect signals..it says “no service”. It is updated. What can i do?? ?